18 awesome things that you may want to add to your (health-inspired) Christmas wish list. Plus, loads of Healthful Pursuit exclusive DISCOUNTS. I’ve got you covered! 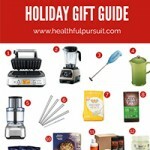 Stumped on what to get that Healthful Pursuit reader on your list? Or maybe you need some Christmas wish list inspiration? 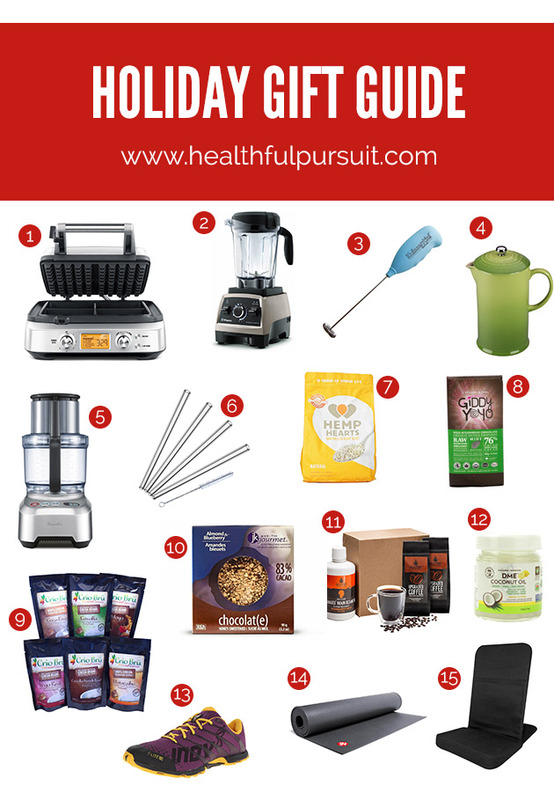 I’ve rounded up my favorite products – kitchen gadgets, daily essentials and tasty treats to inject some health into your wish list this year. You could just send this list to your husband with a couple of x’s and o’s at the bottom of your message. I plan on doing the very same thing. The items I’ve chosen vary in price from $5 to $650 with lots of stocking stuffer, hostess gift, and handmade personal items to choose from. Healthful Pursuit exclusive discount codes and offers… scroll down! Alpha’s Flavoured DME™ is fantastic for oil pulling – it’s a new taste without losing any of the coconut benefits. Plus, it’s also great for spreads, smoothies, and even to fill the house with an amazing aroma when frying. And the perfect size for a stocking stuffer! Bulletproof offers products to help people to reach a state of high performance and achieve their full protential, mentally and physically. Highly recommend the octane oil and coffee. It’s the only coffee I can drink without feeling weird after. Crio Brü is a delicious brewed drink made from the finest roasted and ground cocoa beans from around the world! The real deal- Handmade Organic Heirloom Vegan Raw Dark Chocolate, mineral rich Superfoods & Vegan Edible Organic body care. And many of their chocolate bars are completely unsweetened. Since March 2007, GlassDharma has been producing glass drinking straws. The GlassDharma mission is to create world-wide awareness about single use plastics and how damaging plastic straws are to our environment. Grain-Free JK Gourmet is a Canadian company devoted to making all-natural, preservative-free, paleo-friendly, whole-foods baked goods that taste as good as they are healthy. They love their hemp foods, promoting health & wellness and fostering positive change for the community & environment! Truly Organic Foods is an online store that specializes in education and inspiration of healthy eating and the sale of organic superfoods. Seems highly indulgent, doesn’t it? Black Friday, Cyber Monday, and now we’re prepping our Christmas wish lists. Something I’m experimenting with is gifting people with TIME this year. On Christmas morning, all of those closest to me are receiving a handmade package with a little note inside. On the note is the activity I’ve planned for us for 2015. Lunch out on the town, a day in the mountains, a 1-day retreat, an afternoon at the wave pool. Because at the end of the day? The connections we have with one another create far stronger memories than items bought at a store. So, while I hope that the gift guide I’ve prepared helps spark some health-inspired creativity when you’re out shopping, perhaps looking at the TIME you have as a gift in an of itself may shift the way you approach the holiday season.